1. Cut the end off of the juice container so you are left with a nice plastic cylinder. 2. Leaving 12 inches of wire free, tape magnet wire near the end of container (1/2 inch from edge) and wrap tightly until the coil has grown to at least 2.5 inches and tape other end down, leaving another 12 inch free wire on this end also. 3. Use sandpaper to remove coating from wire to expose a strip across the wound coil. 4. Secure plastic tube to board with screws to keep it from rolling around. 5. 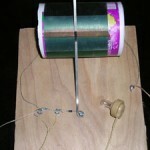 Attach each wire from the coil to a separate screw into the board. 6. Attach the diode (direction not important), resistor, and earphone leads as shown. Attach additional wires on each side as shown–one will become your ground (should be attached to cold water pipe or other ground) and the other will become you antenna. 7. Attach a piece of metal coat hanger so as to press tightly against the exposed strip on the coil. Using this slider, you can tune your radio by adjusting the number of wraps being used.